Gymnastics & Cheer...That's what we do! 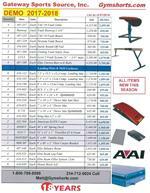 We specialize in providing everything you need for gymnastics and cheer, all at competitive prices. 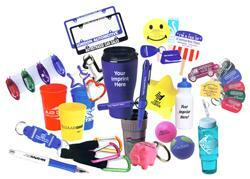 You’ll find a big selection of gymnastic equipment and cheer supplies. Our staff is on hand to help. We’re here to make sure you can find exactly what you need, whether it’s industry-leading Reisport grips or cutting-edge training equipment. Based in St. Louis, Missouri, we’re very involved in the gymnastics community, so we’re in tune with what gymnastics equipment and supplies our customers are looking for. We know and stock the items proven to perform. You can find out more about us here on the site, or simply order the supplies you need. Shop gymnastics grips for bars, wrist supports, tape, foam, buckles, and hook & loop for your gymnast or team; mats, handspring trainers, carpet, spotting belts, tape and foam, tumbling strips and other items for cheerleading. In addition to top brands and a generous selection of gymnastics grips and other items, you’ll find volleyball, track & field, basketball, P.E., and other equipment. You can also purchase gymnast training items that represent the latest in equipment to advance skills, handspring, KIPS, front hip circles and more. Young gymnasts can gain strength, technique and flexibility more quickly with items like the Stall Bar, Launch Pad, and Handstand Trainer. Beyond such equipment as hand grips for gymnastics, we also design apparel (such as tees used in USA Gymnastics events). If you have questions about any of our products or services, please use the contact links on the left side of this page…and welcome to gymshorts.com! We can help with a CAD Layout at no charge, Wish Lists and Financing. 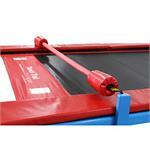 Get new equipment for your event with all the matting. Gymnastics or Cheer. CHECK OUT THE BOULDER IN ACTION!! !